One year after the death of a friend’s mother, the honor of my presence was requested at a private mass at his house chapel and a luncheon afterwards on the property lawns, where no alcohol was served, in accordance with the wishes of the deceased. That’s not a common memorial service in Mexico but neither was the food served: mixiotes. Being raised in northern Mexico, I had never heard of mixiotes until I was about 28 years old when I moved to Mexico City. Even then, the elusive, hard to find dish couldn’t be easily found in a restaurant, street market, or sidewalk food stand. The skin of the Agave salmiana leaves—mexiotl in Nahuatl—needed to prepare this ancient dish, is harvested by peeling it from the live plant and therefore exposing it to death. This variety of agave is found wild in the central plateau of Mexico, in the states of Hidalgo, Querétaro, Puebla, and Tlaxcala. Its long and wide leaves are used not only to make mixiotes but to wrap the seasoned lamb (sheep) meat that will become barbacoa after its cooked overnight in a pit layered with coals. Maguey pulquero is the common name of this agave, because its juice has a high sugar content that makes it ideal to make pulque, a fermented alcoholic beverage. As you can see, agaves have more uses than just making mezcales like tequila but we will discuss this in another post. The Mexican government has prohibited the harvesting of mexiotl in public lands for decades, but our stubborn minds claim that if you use something else to cook mixiotes the taste will not be the same. This preference for the “authentic” has fueled both a black market and a sustainable production market, but the agave demand to produce pulque and barbacoa makes the production of maguey pulquero leaves for mexiotl unprofitable. Most likely, a significant number of the mixiotes I’ve had in my life were prepared with illegally harvested agave leaves’ skin. Once the mexiotl has been harvested, it is sun dried, cut, and packed in squares measuring around 4-5 inches per side. These pieces of “organic paper” are used as packaging material for the ingredients to be cooked. They are not edible but give the dish its name and some flavor. To prepare them for cooking, you rehydrate them to make them pliable, then small pouches are made and filled with meat, chiles, herbs, spices, and sometimes an avocado leaf. 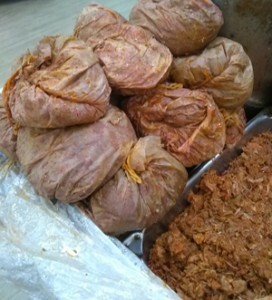 The pouches are closed by tying them with a cotton cord and then steamed between one and two hours depending on the toughness of the meat chosen. Substitutes to mexiotl include aluminum foil, plastic bags, parchment or wax paper. While sheep mixiotes are the most common today—lamb was introduced to this continent by the Spaniards—the Pre-Colonial versions include rabbit, birds, and reptile meat. Modern versions include fish, pork, and my favorite: wild mushrooms. As with every Mexican dish, secrets abound here. I talked to several cooks that carry food traditions from generation to generation and was able to pull some wisdom out of them. 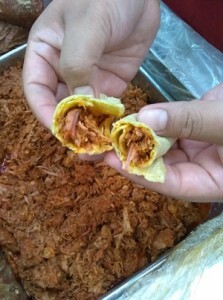 One cook claims that the secret to a good mixiote is to marinate the filling overnight. Common sense dictates that this would be a good practice. Often the recipes for mixiotes call for pulque, but another cook says beer makes an excellent substitute. Another secret I was able to collect is that when using a tough meat—old lamb meat was mentioned as an example—instead of steaming the mixiotes they can be cooked in a pressure cooker. This is also a valid technique but it’s never to be found in a published recipe. Something else that caught my attention was a recommendation that if you are short of mexiotl, use parchment paper but place a small piece of the natural paper inside to flavor the meat properly. Finally, someone told me that barbacoa can be used to make mixiotes! This would make a double cooked dish, which in my view defeats the purpose of steaming but some people make it that way. All this lore fascinates me about Mexican gastronomy; secrets, tips and tricks abound endlessly. Serving time. Place the mixiotes in a bowl and untie the pouch. The contents will be moist and runny. You can then remove the mixotl carefully and dispose of it or follow tradition, which calls for leaving it on the bottom of the bowl. Your choice. I have seen mixiotes the size of a softball, which is food for more than one person that is poured into a serving dish and served as, you guessed right, tacos de mixiote. Today, mixiotes are beginning to be easier to find commercially. Entrepreneurs are producing this delicacy in mass quantities and distributing them through supermarkets. The food is not to be found in the frozen food section but rather in a sidewalk type of food stand. 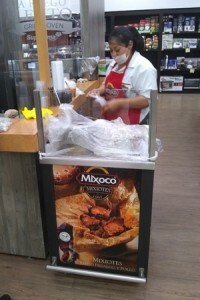 They sell you a complete mixiote by the kilo or you can have a warm mixiote taco on the spot while you do your grocery shopping. And when I think of this concept, I can’t help smiling, thinking what a foreigner would think if I’d say, “I’m going out for mixiote tacos to the supermarket.” I hope you enjoy mixiotes too. A widely accepted variant, these mixiotes are easy to make and delicate to taste. Soak the chopped chiles in the beer for one hour. Reserve them afterward. In a small bowl, place one piece of parchment paper in the bottom with the corners sticking out of it. Place one piece of chicken in the center and sprinkle with the marinated bits of chiles, garlic, herbs and salt. Bring the four corners together and tie them with a piece of cord. Repeat with the remaining pieces of paper and chicken. Place the pouches in a steamer, and cook for one hour. 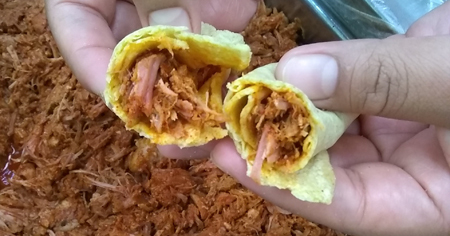 The most popular mixiotes in Mexico, these can be made at home easily. Note that the chops/rack/loin of the lamb is the most tender meat. If other cuts are used, double the steaming time. Mix all ingredients in a bowl and marinate the meat for one hour. If a tougher meat cut is used, marinate overnight in the refrigerator. In a small bowl, place one piece of parchment paper in the bottom with the corners sticking out. Place one piece of meat in the center and add some of the marinade mix. Bring the four corners together and tie them with a piece of cord. Repeat with the remaining pieces of paper and lamb. Place the pouches in a steamer and cook them for one hour. A good vegetarian option, full of flavor and character, and easy to prepare. Toast the chiles lightly on a griddle or heavy pan and soak them in the beer for one hour. In a blender, grind the chiles with the beer, garlic, and salt. Pour the mix in a bowl and add the mushrooms. Let the mushrooms marinate for 30 minutes. In a small bowl, place one piece of parchment paper in the bottom with the corners sticking out. Spoon the marinated mix in the center, allowing for the four corners to come together, and tie the corners with the string. Repeat with the remaining pieces of paper and filling. Place the pouches in a steamer, and cook for 20 minutes.